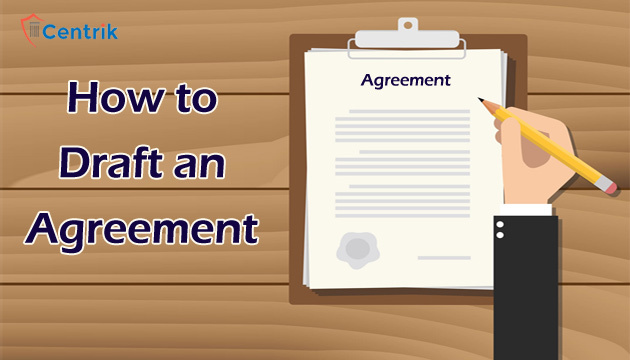 How to draft an agreement on your own for business or for substantive? CentrikBlogsBusiness AdvisoryHow to draft an agreement on your own for business or for substantive? Drafting of an agreement should be done keeping in my mind every detail of the agreement, understanding the parties, roles and responsibility of the parties and inflow of money. 1. Obligation: It is essential to specify which communications will be used for marketing. Also, mention the dominion where the products will be marketed. 2. The inflow of cash: The flow of cash must be well detailed so that no disputes occur at the time of pay-off. 3. Mode of payment: The mode of making the payment at the time of goods/services sold/delivered must be defined clearly. If the payment will be paid in advance at the time of agreement and how the payment will be made i.e. either by cheque, electronic transfer or simply cash must be mention. 4. Procurement of faulty goods/deficient services or non-adherence to service levels: In the scenario where the goods supplied or services provided turns out to be defective then the purchaser has stand-by under the clause of Warranty which defines the extent to which a defective good or deficient service is covered for repairs or replacement by the supplier/service provider and the duration of time for which the Warranty would remain effective. Later, the parties can define their liabilities in terms of some amount which would be payable by the supplier/service provider in case the buyer of goods or recipient of services suffers some damage due to defective goods/deficient service under the clause Liability. The agreement must ensure that the parties will not be sued by a third party for the actions of the other. In order to safeguard this possibility depending on the specific situation of a case, one party agrees to indemnify the other in case a liability arises due to actions by a third party. There is information about the company and its business which is unavailable to the public. Yet there are certain facts may have to be disclosed to the party while entering into a contract with the other party. Therefore, parties swathe themselves to confidentiality and non-disclosure of each other’s confidential information. Here exclusivity means that during the continuance of the contract, the contracting parties would not enter into negotiations or even into an agreement with a third party for similar nature of work/product/services. Since drafting an agreement involves sizable legal advice you can reach our experts at support@centrik.in Centrik has been into legal advisory for our customers for last 5 years, with domain experts including lawyers, bureaucrats etc. in pan-India working on the delivery and customer’s satisfaction.